I was amazed. I ordered flowers for my mom on 2/13 and they were delivered 2 hours later! That was great. One never knows when purchasing online if the item will be up to the standard. These flowers were VERY well done, healthy and delivery was on time! Thank you so much! Excellent service. Beautiful flowers! Spectacular arrangement for a birthday surprise! Very professional. They had my order right on time and the arrangement was perfect. Ordering process was smooth. Delivered on time. Flowers looked beautiful. It was nice and easy to go on line to send flowers to our daughter for a special occasion. Thanks for the online option. My daughter loved her bouquet which was delivered promptly. Thanks for the quick one day service! Incredible service and wonderful product results!! You delivered an absolutely beautiful bouquet to my mom for her birthday, her first since my dad died in November. They truly brightened her day and her home. I live out of state but will continue to use you for any local needs. Great service and help! Highly recommended. My friend said she was very pleased with the flowers (and the chocolate rose)! The flowers were beautiful and lasted 2 weeks in a very warm environment. The flowers were beautiful and the deliverer was very pleasant. It’s my second time to order flowers for my student, and definitely won’t be my last. Thank you. As always, an excellent job. A beatiful arrangement was delivered to UCONN dorm on my student’s birthday and day before Easter. Thank you! Highly recommend. Thanks for the quick delivery before the snow storm hit. A beautiful arrangement was delivered to my daughter's dorm on her birthday. I will gladly recommend the Flower Pot! I ordered the "Red Rose Bud Vase" for my girlfriend for Valentine's Day and it was exactly as shown in the picture! Needless to say she was very pleased with it. picture true to life. Delivered early in the day. Your flowers arrived just as the picture. Beautiful! And you were able to track down my daughter at UCONN. She loves them. Thank you. I sent flowers to my granddaughter at Uconn for her birthday. She sent a picture of them and they were beautiful. Also thanks for the great service. My mom thoroughly enjoyed the fresh flowers. Easy to order, delivered as promised and looked great. Service was outstanding, and the arrangement was beautiful. I will definitely shop with you again. I received a beautiful plant from a friend. I wasn't home when it was delivered, so the Flower Pot called me to tell me they had delivered it, which was very thoughtful. It's in a very nice ceramic pot, too. I am very happy with it. Easy to order online, delivered right on time, GORGEOUS flowers! I sent an arrangement to my aunt-she said it was beautiful and was "the talk of the nursing home." I was very satisfied with The Flower Pot. One of the most beautiful flower arrangements I've ever received! Absolutely gorgeous and in a very nice vase with a decorative touch. The flowers continue to look fresh and vibrant after several days. I almost never leave comments on any products I receive, but this one deserved an excellent review. Great service and wonderful experience ordering with you via your website. This is the second time I have used your services when I needed flowers in the Storrs/Willington area. The recipient was thrilled and sent me a picture of the arrangement .Once again the arrangement was absolutely gorgeous as it was during my first purchase. I would definitely recommend your services to anyone who needs flowers in that area. I'm so happy to have found a florist of your caliber that I can call upon!! The item was exactly as described as the recipient sent a picture and it was beautiful and exactly as I thought it would be....thank you. The staff was so helpful and friendly! The product was amazing and my special request was granted! I will definitely be ordering from the in the future! Flowers were delivered on time and a big hit. Fresh and lasted for days. Thanks. Gorgeous selection. Fast and easy! Very easy to order. Wonderful selection. The flowers arrived on time and were even more beautiful in person. I will definitely recommend your shop to anyone looking to order flowers. Thank you!! My daughter loved the flower arrangement I sent her at UConn. She sent me a picture and it was beautiful. She was well notified and it was easy to order on your website. I don't plan on ordering flowers often but if I do I will absolutely be using the Flower Pot! Thank you. Timely delivery and lovely arrangement. The flowers were incredible. Small mix up with where they were delivered but that was easily fixed. My wife works on campus so I will be using your services again in the future. I am not sure how you did it. My husband was told there was no promises the flowers would arrive to me on Valentine’s Day. We he did not tell you is that he is a deployed solider who had not had time to order them ahead a time. So thank you for the beautiful flower arrangement, but more importantly, Thank you for making his day! Wonderful arrangement!! Sending from Michigan, so pleased with it!! The recipient raved about the basket. I was extremely happy with the whole experience. Great service! Our birthday girl was thrilled. Having never used your company I was a little nervous. After my experience I would definitely use your company again and I would recommend you. Thanks for your prompt service and for your beautiful flower arrangement. service was great my daughter was very happy!!! Beautiful flowers, friendly staff and unique gift options! Love this shop! Delivered on time and was very nice. Jesse, I came home Wednesday to find this beautiful bouquet of flowers from the Flower Pot. I don't know if you were the one who delivered them, but they are gorgeous! What a treat. Service was great. Would buy again. exceptional service. My friend was extremely delighted with the bouquets that were sent to her on her birthday. Thank you so very much. The service was great and the flowers were beautiful. I will definitely order more from The Flower Pot! On behalf of my husband and myself I would like to thank you for the beautiful job that was done on the funeral arrangements for my husband's mother's funeral. Theywere exactly as describedand beautifuuly arranged. This was our first experience with your company, but definitely won't be the last. Thank you again for your attention and professionalism. It is always easy to order and the staff is extremely professional and friendly every time! FLowers were delivered on time to celebrate my daughters birthday. Even ordered a the last minute. Two weeks later and a road trip home from UCONN and they are still beautiful! There is a great variety to choose from. The item I ordered was beautiful and the recipient was thrilled. I would order from Flower Pot again and recommend it too. Thank you! The flowers arrived when expected and my sister was so elated she asked her boss to take a picture with them. Thank you for the great service. As always the flowers were beautiful and lasted almost two weeks! Great place to order flowers from. Nice local vibe. Very fresh. Would definately use again. Excellent service. You delivered it quickly in time to celebrate her birthday which was that day. She loved the flowers! AND it was affordable. Thank you! I was very pleased with the timely delivery of flowers on my mother's 80th birthday. I didn't see the flowers, but my mother was very happy and said they were beautiful! I really appreciate the lengths your driver went to in delivering the flowers ordered for me. I was not at home to receive them, so she arranged to drop them off at the UConn campus (where I work). I am grateful she was able to go above and beyond to make sure I got my order in a way that was convenient to me. And the flowers are beautiful too! Delivered fresh and on-time. I would order from this business again. Thanks! Jessie and her team at The Flower Pot recently did all the floral arrangements for my wedding (bouquets, boutonnieres, center pieces, and more!) . Everything was beyond beautiful and exactly what I wanted! They went above and beyond. Jessie uses flowers from local growers when possible - so the flowers are as fresh as possible! It also helps to further support local business. I would recommend The Flower Pot to anyone and everyone for any type of floral needs. Speedy delivery & flowers were gorgeous. Thank you! The arrangement was perfect! I would definitely order flowers from you again in the future. Timely delivery and most importantly my wife always loves the flowers she receives. Lovely flowers! Just great! And tulips are still looking great after 5 days. Thank you for making a beautiful arrangement and making my mom so happy. Fabulous as always! Gorgeous pink arrangement. Flowers last forever (well, not forever, but a long time!). Thank you! Absolutely fabulous customer service, delivery was on time and their website is very easy to order from. Flowers were so beautiful, a lovely arrangement. The bouquet was beautiful. You guys paid attention to the special request (white and green flowers with a vertical vase and variegated foliage) and made a gorgeous arrangement. Thank you so much! Very reasonable prices and delivery rates! Very easy check out process! Thanks so much! Always the best flowers and very helpful. The arrangement for my sister was absolutely beautiful (she sent me a picture) she was so pleasantly surprised she cried. The ease of shopping on your site made my choosing an arrangement easy. I would definitely use the Flower Pot again. Very pleased! Your quality and quick service are making me look really good! Recipient said arrangement was stunning! Flowers were delivered on time and as pictured. My 15-year old granddaughter was thrilled! Thank you so much. The arrangements I have gotten from the The FLower Pot are absolutely gorgeous. The flowers last a very long time. You know the flowers you are getting are fresh! It's so nice to have a local florist! Flowers are beautiful, fresh, professionally arranged and delivered. The Flower Pot is conveniently located right on Dog Lane. The staff is friendly and helpful. I will never go to the grocery store again for flowers! I've had several arrangements from The Flower Pot and each was beautiful. I'm amazed how you create lovely art with flowers, greens, and a vase. You turned a simple Mason Jar into a charming attractive noticeable centerpiece. Thank you! The Flowers Pot did our wedding flowers and they were absolutely perfect! Highly recommended! Didn't have to worry about a thing. 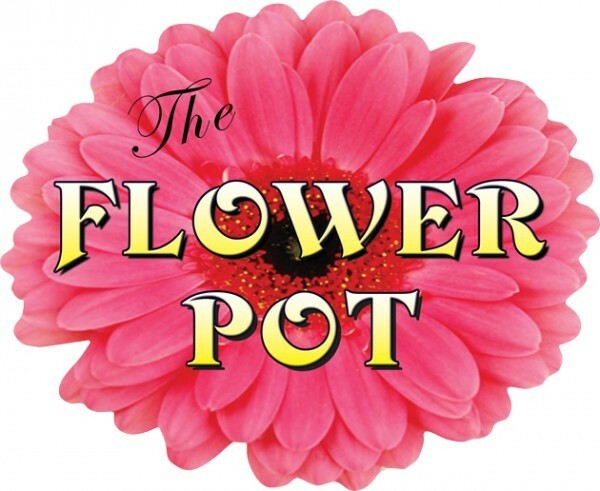 If you need wedding flowers go to the Flower Pot. You won't be sorry! We are so glad we went to the Flower Pot for our wedding flowers. We ordered 2 arrangments, pew bows, and all the wedding party bouquets and such. Everything was beautiful, delivered on time, and they were so friendly and helpful. It was better than I could have ever imagined! The arrangements I've gotten from The Flower Pot have been just beautiful. They are nicely done with flowers bought l-o-c-a-l-l-y, and they last a long time. Nice job ladies! !